Made in Moscow around 1930. 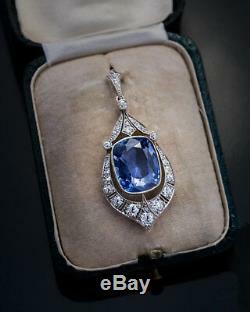 A vintage silver-topped 14K gold Art Deco pendant features an impressive 12.47 ct natural unheated sapphire from Ceylon. The sapphire is set in an elaborate frame embellished with transitional and old cut diamonds (approximately 1.10 cttw). Marked with 583 Russian gold standard (on frame) and makers mark (on bail). Total length 43 mm 1 5/8 in. Width 19 mm 2/3 in. The pendant comes with AGL gemstone report for the sapphire. The item "Rare 12.47 Ct Ceylon Sapphire Diamond Vintage Art Deco Pendant" is in sale since Friday, August 25, 2017. This item is in the category "Jewelry & Watches\Vintage & Antique Jewelry\Fine\Art Nouveau/Art Deco 1895-1935\Necklaces & Pendants".com" and is located in Chicago, Illinois.